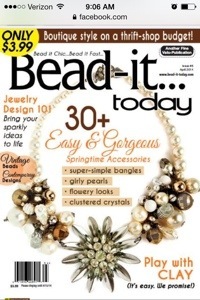 You can imagine my surprise when the first piece I submitted to Bead-It Today was selected for the April cover! I know this is a short post and I’ve gotten quite sporadic with my blog, but I just wanted to share and encourage all of you to keep pushing towards your goals! I’m so thrilled to be published again in the latest issue of Jewelry Affaire (on sale today)! My “Love Letters” (originally named “Enveloped”) series as well as my “Miracle of Love” necklace were featured. I hope you enjoy them. I just wanted to share some of the jewelry I’ve made using swags, ornate plaques, and necklace bases from B’sue’s Boutiques. Visit her shop here, like her on Facebook here, and you can even join her creative group on Facebook here! Some of these pieces have already sold, some are in my personal collection, and some are still for sale in my etsy shop StrandedInTheCity. Enjoy! So I didn’t see it in time to join Erin Prais-Hintz’s Toast of the Town variation blog hop, but I made my own version today anyway! You can see all the other versions at Erin’s blog “Treasures Found“. The necklace can be worn SEVERAL different ways: twisted, short, long, clasp on the side, clasp in the back, and more. I’m selling mine in my etsy shop StrandedInTheCity. Enjoy!